The following work by FSO Brian Aggeler extracted from State Magazine, originally published in December 2001. Mr. Aggeler contributes cartoons regularly to the in-house magazine of the department. Mr. Aggeler arrived in Skopje July 15, 2010, following Macedonian language training in Washington. Before that he served as the Political Counselor at the U.S. Embassy in Hanoi, Vietnam. From 2002 to 2004 he led the U.S. mission to the United Nations Educational, Scientific and Cultural Organization (UNESCO) in Paris, France during the U.S. reentry into the organization after an 18 year absence and served as the new mission’s first Charge d’Affaires. He joined the U.S. Foreign Service in 1990 and has also served in India, Burkina Faso, and Hungary as well as Washington. 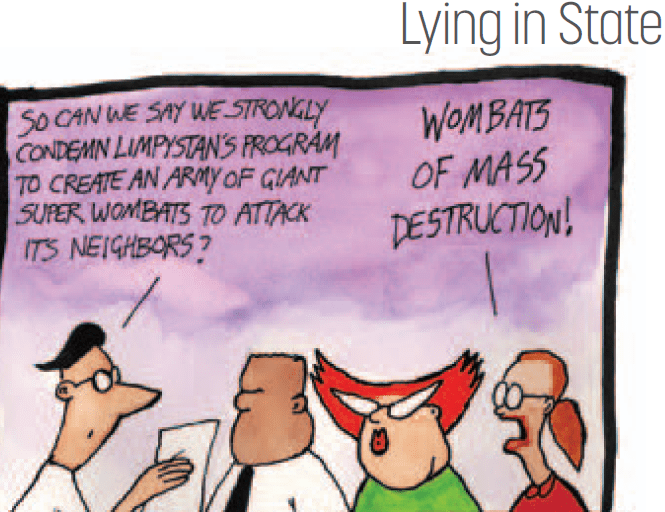 Those damn wombats, must be why W. could not find them anywhere.